The cost of college is rising across the country, and many budding scholars are trying to determine how they can afford the price tag attached to tuition with a cost of college calculator. This free template helps future students and their parents to create a list of expenses and to see what is practically affordable for the family. You need look no further as the template is very easy to use, and you can download it right here. Furthermore, the template can be customized to the exact needs of you and your family as every educational and financial situation is different from the rest. Planning for the cost of college doesn’t need to start happening right before applications are sent in. In fact, this customizable budget allows parents to begin putting money away as soon as their little one enters into this world. By working with the college calculator template and the cost of college calculator, parents can determine how many years they have left to save, approximately how much college costs might increase by then and how much money they already have saved. Starting to track information as soon as possible. Realizing that it is never too late to start planning for college. Being honest about how much college is likely to cost by the time your child goes. Really assessing the type of university your child will attend. Researching the current cost of colleges and universities instead of just guessing. 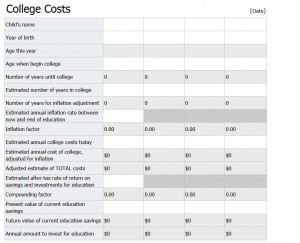 Realistically estimating how much money you can save before your child goes to college. Being prepared to start putting away funds on a regular basis. Parents might still be surprised at how much college costs, but they can at least be prepared. This cost of college calculator allows you to gain a realistic perspective on both your current and future financial situations in terms of education.